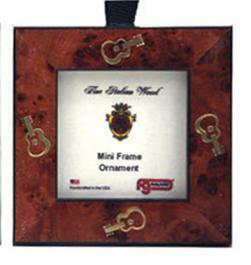 Made in the finest Italian tradition, here in the USA, is an especially lovely Miniature Photograph Frame Ornament. It is made of High Gloss Chestnut Wood and measures 2.75" square. It features a little golden embossed classical guitar on each side with a ribbon loop for easy hanging on a wall or Christmas tree. Please scroll down for more information about this item.